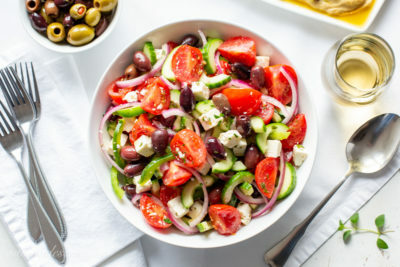 Enjoy this Easy Greek Salad Recipe made with crisp, fresh vegetables, feta cheese and olives, and simply dressed with herbs, oil and vinegar. Salads don’t get much easier than this, or more delicious. The flavors and components all come together in a deliciously crisp bite – like a summer symphony! 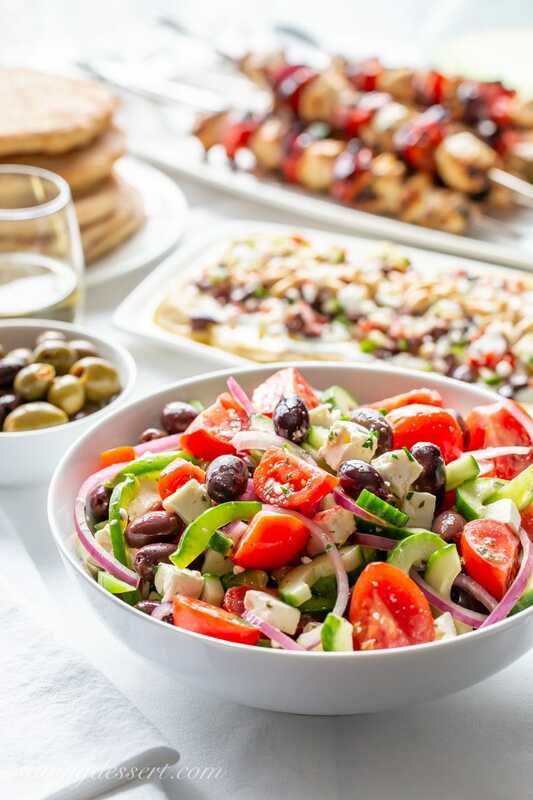 Authentic Greek salads are simple and lightly dressed with olive oil, vinegar and fresh herbs. The richness of the feta and brininess of the olives brings complexity to the salad without overpowering the vegetables. Crisp, ripe vegetables and fresh herbs are the keys to this simple Greek Salad recipe. When a recipe has only a few key ingredients, they should all be at their best. The cucumber and bell pepper should be firm, not soft. Look for small ripe tomatoes like these Campari which are bigger than a cherry tomato and smaller than a plum. Use fresh herbs in place of dried whenever possible. And finally, look for block feta cheese stored in a brine instead of crumbled. It makes a world of difference in the flavor and the few minutes you spend cutting the feta into cubes is worth every second. Pre-crumbled feta tends to be a little dry and in really small pieces. Pick up a small amount of the good stuff, you’ll never go back to vacuum-sealed crumbled feta again! Every dinner needs a fresh component like this Greek Salad recipe. 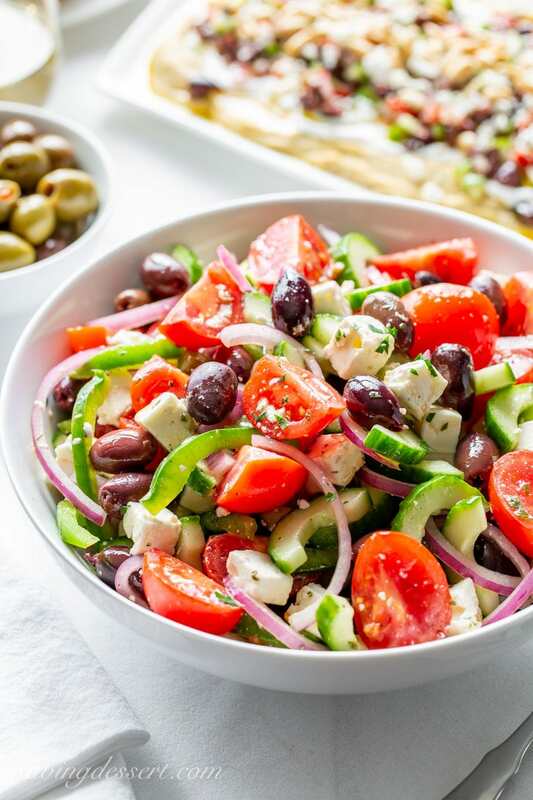 Fresh Greek salads are a terrific side with just about any meal. I especially love these Greek flavors with grilled meats like chicken and steak. But don’t forget that Greek Salads can be the jumping off point for a great main course salad too. Add sliced chicken and a little arugula or lettuce for a light lunch or dinner. Toss our Greek salad with cooked pasta to enjoy as a meatless main any day of the week. Scoop Greek salad into the pocket of a Whole Wheat Pita bread with a smear of hummus for one of my favorite sandwiches ever! 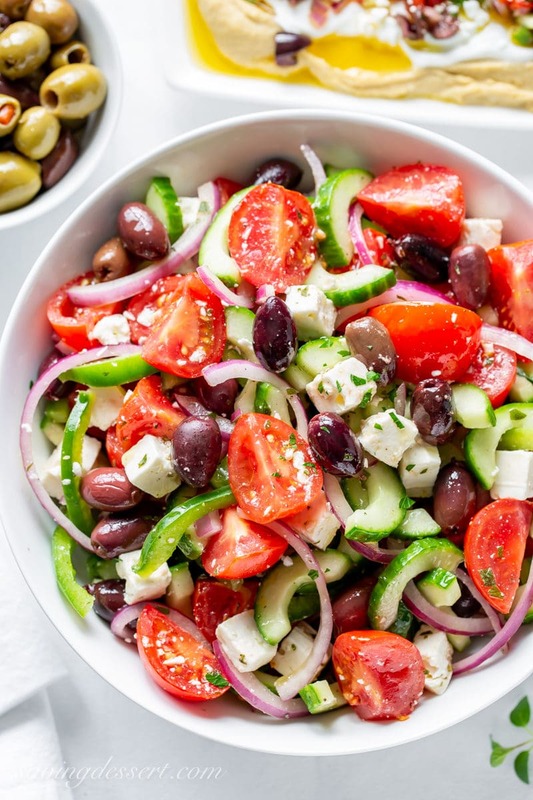 Or serve this crispy, fresh delicious Greek Salad as part of your Greek themed dinner party! 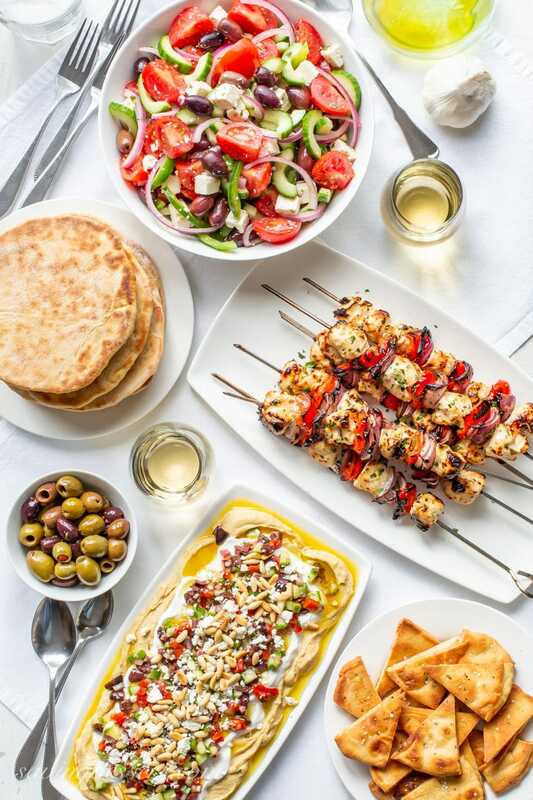 Complete this meal with homemade Whole Wheat Pita breads, juicy Grilled Greek Chicken kabobs, and our favorite Greek Layered Hummus Dip. Enjoy! Combine all the vegetables in a large serving bowl. Combine the dressing ingredients in a small jar with a lid. Shake the jar until the dressing is combined. Pour the dressing over the vegetables and allow the salad to rest at room temperature about 30 minutes for the flavors to blend before serving. With layers and layers of flaky phyllo slathered with melted butter, honey and loads of nuts – who can resist a slice or two of this delicious Honey Baklava Recipe?! 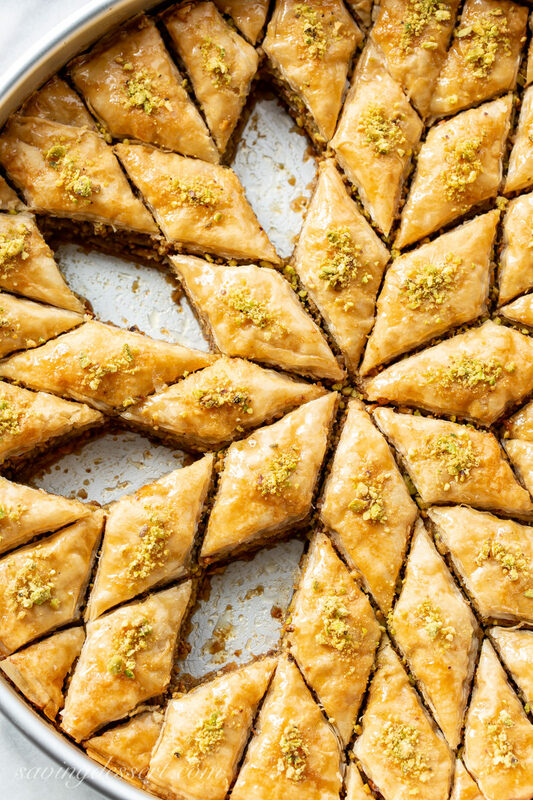 Baklava can be made days in advance and stored at room temperature making it great for company and gatherings. This recipe is easily halved for smaller groups and is much easier to make than you would think. Give it a try! I’m with you Angie – thanks! We love Greek and Serbian salads and I could make an entire meal of one and a nice crusty baguette. That settles it, I’m recreating every aspect of this Greek feast this weekend, off to the supermarket to get stocked up ~ love this Tricia!! Greek salad is a favourite here! I just love the all the fresh vegetables bathed in a delicious Greek dressing 🙂 Yours looks absolutely perfect! Here too Jennifer – thanks so much! I could eat my weight in a salad like this. Love all your Greek dishes this week, Tricia! You’ve got me craving Greek everything now!